Ilich Ramirez Sanchez was named after the Russian Marxist revolutionary Vladimir Ilyich Lenin by his father, a well-known Leninist lawyer, as were his younger brothers Lenin and Vladimir. Born in Caracas, Venezuela in1949 Ilich became much better known as Carlos the Jackal. The exploits of the revolutionary fighter has now been turned into a five and a half hour, 3-part French-German television drama and shown as a feature film in selective cinemas. Directed by French director Oliver Assayas (Irma Vep 1996, Clean 2004, Paris jet’aime 2006, Summers Hours 2008) Carlos (2010) was first shown out of Competition at the 2010 Cannes Film Festival. The mini-series follows Carlos from his attempt to assassinate Joseph Sieff the Jewish chairman of Marks and Spencer and vice president of the British Zionist Federation (an organisation that campaigns for a permanent homeland for the Jewish people) in London in 1974 up to his arrest in 1994 and subsequent life imprisonment for the murder in Paris of two French secret agents and an PFLP informant. One of Carlos’s most notorious achievements was the OPEC raid on December 20th 1975 when he led a six-person team and assaulted their leaders meeting in Vienna, and took over sixty hostages killing three people in the process. The other famous member of the group taking part in the OPEC raid was Gabriele Krocher-Tieman ‘Nada’ who was a member of Germanys second generation Red Army Faction. Carlos also launched a bombing campaign to force the French authorities to release his wife, Magdalena Kopp, following her arrest in Paris in 1982. Magdalena Kopp - Carlos's wife. After nearly 35 years it’s difficult to get to the truth behind some of these events and fill the gaps that the media left when they reported on only certain aspects and actions giving their own version of events. It was planned to make a movie about Carlos’s arrest in Sudan, but when the director read deeper into our insurgent the original idea grew into something far more ambitious, namely to make the series of films about his broader life rather than concentrating on a small section. Filmed as far as possible in real locations it manages to successfully give an accurate look and feel to the 1970’s and 80’s settings. Assayas typecast the commando’s based on what is known and obviously used dramatic freedom for the rest but attempted to be somewhere near the accepted truth, delving deeply into the psyche of Carlos successfully fleshing out a human face. Like all great soldiers of the revolution Carlos appears to have a somewhat confused ideology and at times baffled the puritanical left wing who suddenly had a champion that was a cross between a gangster and a rock star but intelligent and well educated. 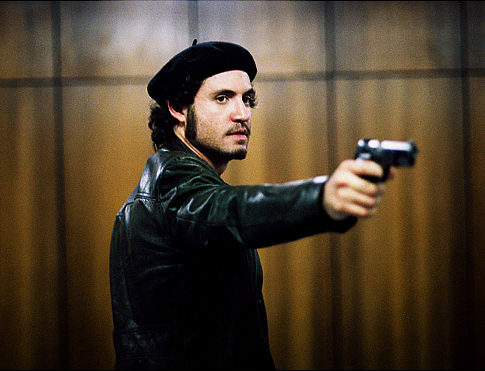 Edgar Ramirez is probable one of the very few actors that could give credence to the part having to be both convincing at various ages and being capable of speaking four languages. The film would have been inconceivable without this actor who manages to portray the power of Carlos as well as showing the human side of this fascinating legend. Treat yourselves to a piece of modern history.